"I'll make a ce-ment coffin for the first man that moves." 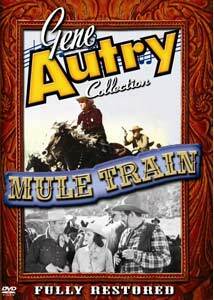 One of the most popular songs of late 1949 was the raucous Western song Mule Train, with its infectious accordion part. Over 30 versions were recorded in the space of a few months, and Gene Autry was quick to capitalize on the craze by turning out this picture in early 1950, which not only borrows the title but prominently features three different renditions of the song alongside an offbeat story about civilizing the West. Gene is a U.S. Marshall who runs across muleskinner Smokey Argyle (Pat Buttram), who has, with his partner Judd Holbrook (John Miljan), has discovered the first deposit of cement west of the Mississippi. Smokey heads for the nearby town of Trails End after Gene tells him that they're intending to build a dam, and hopes to sell them on the idea of using his cement. But the local wagoner, Sam Brady (Robert Livingston), intends to get the dam contract for himself and he'll stop at nothing, including murder, to keep Smokey from getting the rights to build it. Gene helps out, hiding the fact he's a lawman, but he has plenty of trouble on his hands with the lady sheriff (Sheila Ryan, who would shortly thereafter become Mrs. Pat Buttram). This saga of the old west is unusually dark and cynical for a Gene Autry picture. At times it almost feels like a cross between a western and a film noir. There's something about Livingston that makes him a far more credible threat than the garden-variety villain in these films, and the numerous fist-fights are pretty harsh (though there's no blood). The town is not much help to Gene either; the city fathers seem to be solidly in Brady's pocket and Smokey can't get a fair shake no matter what he does. The finale is quite well done, with an extended suspense sequence as the mule train carrying the cement and equipment has to dodge the outlaws' stolen blasting powder. There are some first-rate stunts and rapid inter-cutting to keep the sequence from flagging. Buttram gets one of his better parts here, since he gets to do a little comedy relief but also has an actual character with motivations rather than being a mere sidekick. He takes the role and runs with it. Ryan is decent enough; though initially quite stiff, it soon becomes clear that's the character rather than the actress. Clayton Hodges is memorable as a banker who is trying to get out of Brady's clutches, and Vince Barnett takes on some of the comedy duties as a put-upon barber. There are only three different songs in this effort, but they're all winners. There are the three different versions of the title song (one featuring Buttram prominently), plus Autry's hit Room Full of Roses and a fine rendition of the traditional The Old Chisum Trail. Just make sure you like the title song, and you'll be fine. Image Transfer Review: Although the source print seems to be in fine condition, the picture has an overly-compressed, harsh digital appearance that may indicate excessive use of digital noise reduction. There's a fair amount of grain and it tends to be sparkly, and aliasing is frequently visible as well. This probably would have been a good candidate for dual-layer treatment. As usual, however, greyscales are quite good, but a few day for night sequences are plugged up (which may well be a fault of the original). Audio Transfer Review: The 2.0 mono English track sounds pretty good for the most part. Some of the dialogue has a bit of a fuzzy edge to it, as if there were a bit of static along with it. The songs sound fine, however. Extras Review: The Gene Autry Foundation heaps on the extras again, with the standard Melody Ranch Theater intro from 1987 featuring Buttram reminiscing with Gene about the filming on location near Mt. Whitney, meeting his wife during the shooting, and the fact the Museum of Modern Art named this film the best B-western of all time. It's pretty informative for a mere 10m:06s. The Melody Ranch radio show from April 1, 1950 (29m:35s) includes the usual assortment of songs and tomfoolery, complete with the hard-sell Doublemint ads. A Columbia re-release trailer is included, as well as filmographies for Gene and Pat, galleries of over 50 stills, a handful of lobby cards and posters, and excerpts (unfortunately seldom readable) from the film's presskit. Finally, Alex Gordon contributes a brief set of notes. Another solid Autry outing from late in his career, with a highly unusual noir edge to it. Compression seems a bit excessive, but there are the usual fine array of bonus materials.